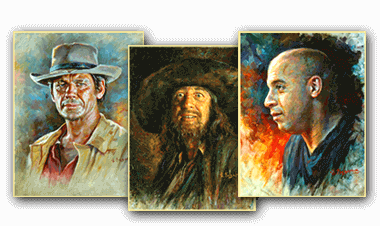 A portrait painted by artist Igor Kazarin in a dry brush technique. 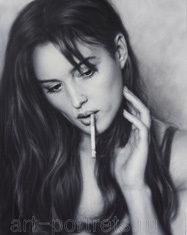 The portrait of Monica Bellucci, the famous actress and top model, is perfect for any interior. 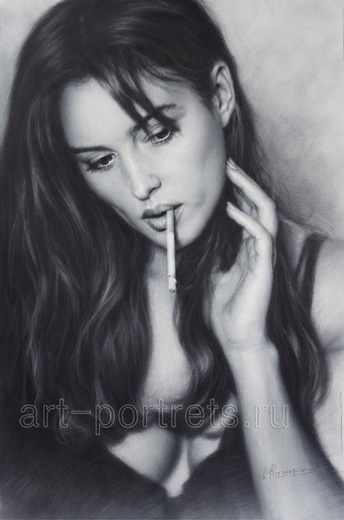 On the site it's 3 portraits of Monica, the first I drew in 1994, the 2nd portrait painted in 2009, the first one I painted as a street artist, then the young Monica Bellucci, painted in the mid-1990s, when in Hollywood about this brilliant beauty, No one knew. 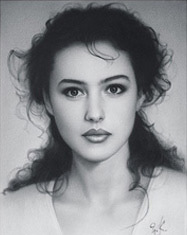 Monica Bellucci is the most beautiful actress of Hollywood, she is even called "Second Sophia Loren" with whom she has much in common. Monica possessing excellent external data from birth, without much effort, found a job in the modeling business. Amazed by her beauty and brilliance of perception, Monica Bellucci is invited by the famous fashion designers Dolce and Gabbana to the most elite model agency, famous for the whole of Italy "Elite", Monica is noticed by Italian filmmakers and in 1990 she begins acting in episodic roles in Italian cinema: Life with Sons, Abuse, Bandits, and in the serious role of the bride of Dracula in the film Dracula, the famous film director Francis Ford. 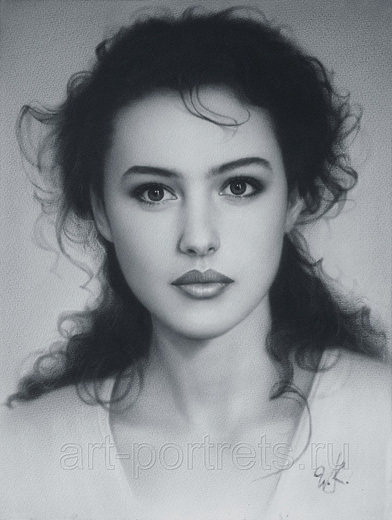 Later she is offered to act as director of Europe and America, where Monica Bellucci finally becomes a world celebrity, starring in the films Doberman, Secret agents, the Wolf Brotherhood, Asterix and Obelix: Cleopatra's mission, The Matrix: Reloading, Irreversibility. The husband of Monika Beluchi is the famous French actor Vincent Cassel, together they starred in the films: Brotherhood of the Wolf, Doberman, Flat. 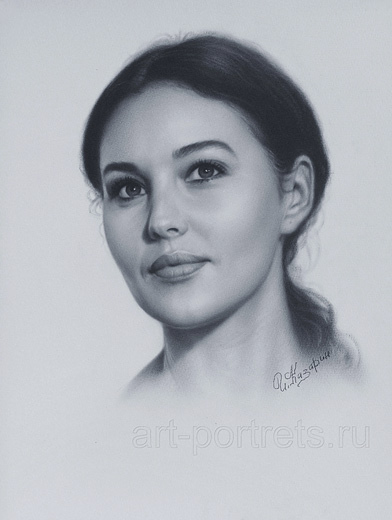 If you are a fan of Monica Bellucci, you can order a portrait of your favorite actress from any of your favorite photos.